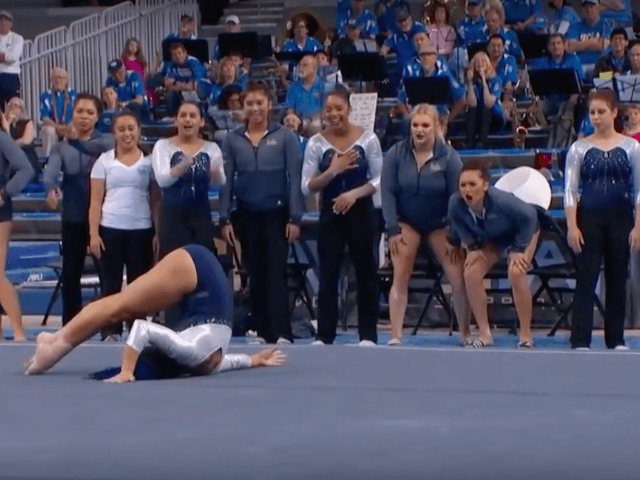 A female gymnast at UCLA has set the Internet ablaze with a floor routine that incorporates popular hip-hop moves. Senior Sophina DeJesus scored a near-perfect 9.925, according to the Huffington Post, thanks to a well-executed of jumps and precision landings. But she is drawing fans on campus and worldwide for the moves she added between passes: “She whipped out the whip, the nae nae, and hit the quan before ending with the dab,” notes HuffPo. A video of DeJesus’s routine, recorded just a few days ago, already has well over 7 million views on YouTube. The New York Times notes that DeJesus is an All-American on the uneven bars, but rarely appears on the floor. Her routine in a meet against Utah was the first she had performed on floor all season–though not, perhaps, the last. The Times also notes that hip-hop may not score quite as well at the Olympics, where gymnasts have less time between floor passes and the judges tend to favor traditional music and moves. However, it is sure to have an impact, as the Summer Olympics in Brazil draw nearer, and competitors look for any way to achieve an edge.